Two weeks into their residence, Clara, Lorena, and Peach have settled in nicely. While they don't come a-runnin' when they see me, at least they don't run in the opposite direction, as they did their first week. They eat like slobs and seem to enjoy watching the songbirds who fly in to eat the food they spill outside the coop. Deets stopped by the first day they arrived but, much to my surprise, he has stayed out of the garden ever since. I think they talk too much for his tastes. They'll hop onto my hand now, and let me move them about the coop. 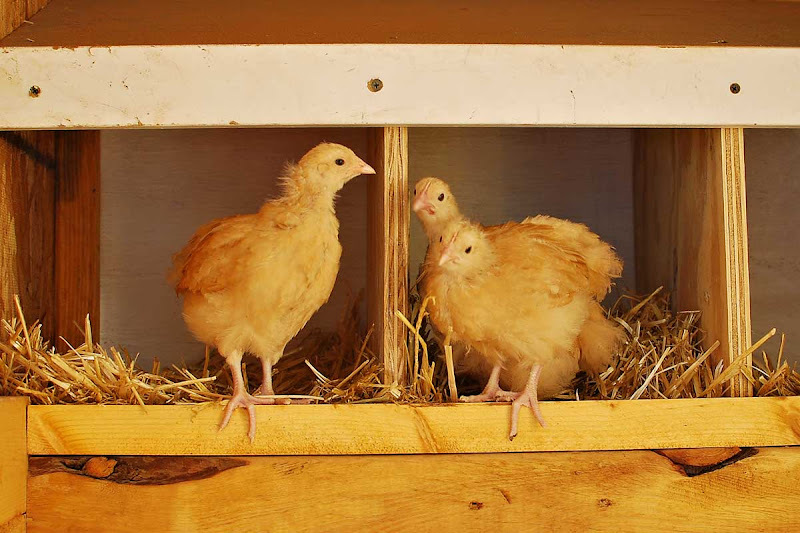 I like to put them up on their roost or in the nesting boxes and watch them try to figure out how to get back down. It's still impossible to tell them apart. I'm hoping their personalities will distinguish them as they get older so I can call them by their names. They won't start laying eggs until around September. Until then, they only have to eat, grow, and pose for the camera. I can't believe how they've grown, and to have them hop in your hand already is fantastic ... it won't be long and they'll come a-runnin' to you. Poor Deets ... traumatized by 'the ladies'! I never would have imagined!! Nice girls! Will they be white as grownups? They are starting to take a real chicken shape. I hope you have lots of eggs. Cakes are so much nicer with fresh eggs. I wish I had a source. When I was a young girl my Dad decided he wanted to have chickens again. I remember 25 fresh hatchlings (no feathers) in a cardboard box IN OUR BATHTUB with a light above it to keep them warm. Thanks for the jog down memory lane, and enjoy your fresh eggs! Buff Orps are my all time favorite chicken. So friendly. Your girls are beautiful! When their faces mature, you'll be able to tell them apart. Personalities will come out as well. Oh, they are ADORABLE! I nearly came home with 2 chicks myself. They were at the feed store. BUT, my husband would KILL ME!!! We live in the city and I'm sure they are prohibited! What is it about watching chickens? They are so animated and busy. I love my Buffs too. Great addition to your ranch. B-Gawk! Yipee, a chicken post! Your girls are getting so big and adorable! It's a good sign, I think, that they don't run from you and will jump on your hand. My cats don't seem very interested in the chickens either, but two of my three dogs are still way too curious! As a matter of fact, they are lying at the door right now, begging to go out and check on the chickens! What about Smooch? 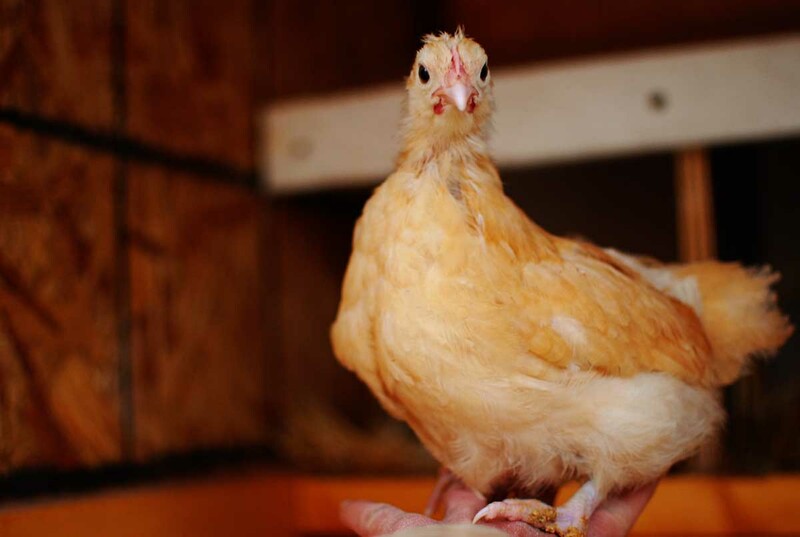 Cheryl Ann, I wouldn't be surprised if your city will allow chickens...surprisingly many will. I live in the city and we are allowed up to 10 hens, no roosters. They are so much fun! Last picture: Kate Moss without the cosmetic and photographic help. Makes me want chicks again...No, I will leave them to you! We did love the Buffs, they were friendly and loved attention. 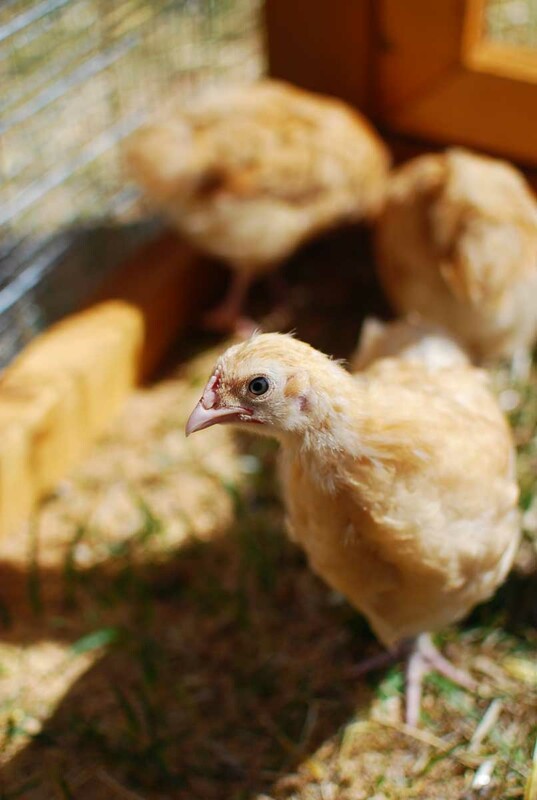 Perfect birds for small children to learn chicken husbandry. 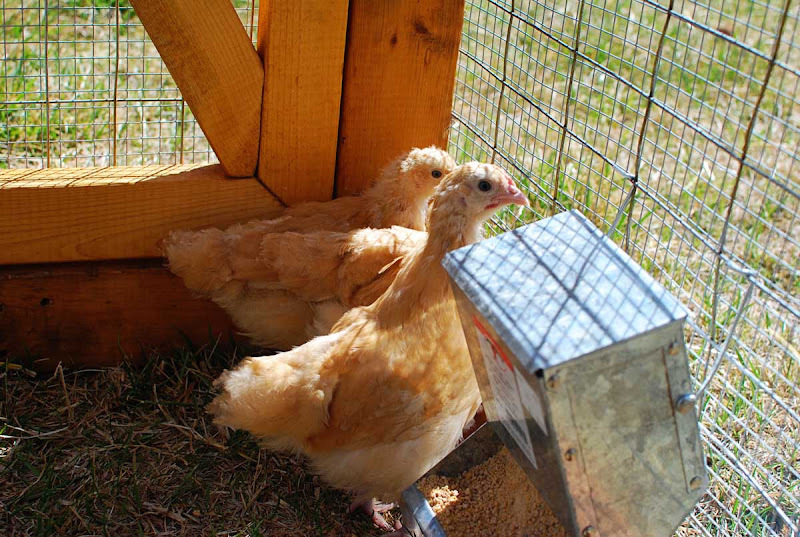 They are so cute...I've always loved the idea of having a few egg laying chickens myself and so am very interested in following these three. Thanks for keeping us posted. I've been wondering when we would hear about your newest 2-legged additions. How is the roaming hen house working out? They do grow so darn fast. I loved our girls as little chicks. We picked one of each kind they had at the feed store so we could tell them apart, but we never did name each one, other than to call them by color... yellow chicken, red chicken, light yellow chicken. Original, I know. Hey chickies! They're delightful. I miss mine so much this time of the year, pecking around the yard doing the natural pest removal thing. Only the swallows do a better job, but that's cause they have wings that WORK! Oh I am so jealous! 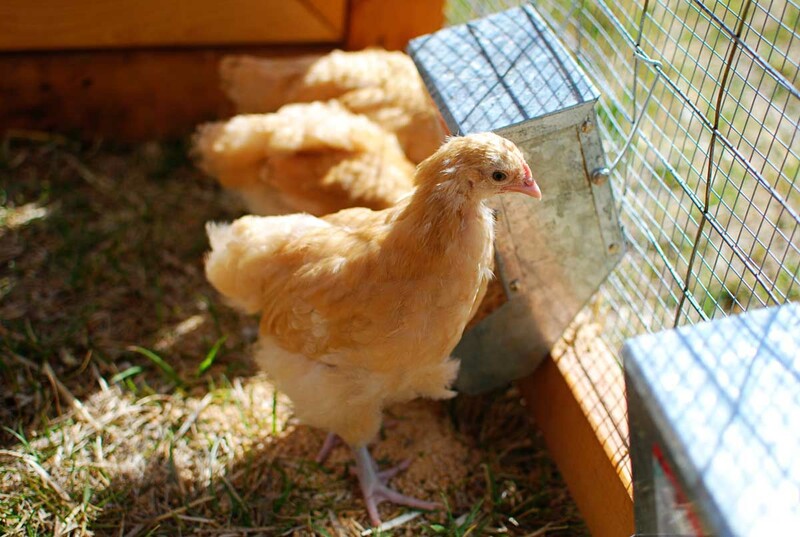 I have been away for a bit and now you have chickens! We are trying to talk Hubs into getting a few. They will be great fun! Now I'm not a live-chicken fan, but these birds are beautiful. More fodder for awesome photos! Can't wait to see these girls develop!